Birds Birds and more Birds! Next, I got Chickadee, a green and peach face lovebird, followed by lovey and dovey, a black mask and peach face lovebird. It didn't stop there, for I managed to buy Pearly (dead after taking her first bath) and after that, a cute BIG English budgie, Rolly and Poly (Poly died, not sure why, maybe it is old age). Still, I couldn't stop, and Noisy (violet budgie), together with Lucky (baby grey English budgie), Pearly (starting to recycle names now!) a pearl cockatiel, Funky (half lutino half pied face cockatiel), Snowy (white and bown white face cockatiel) and Bluey (blue lovebird) soon joined the family. The last bird I got was Starry, and Starry is probably the bird I like best! It is still a baby, a lesser sulphur crested cockatoo, and it can already say Hello and Bye Bye! IT loves getting hugs, kisses and scratches at the back of its head, and will actively seek us people out when it is let out of the cage. It can fly and is super super cute! I am still trying to wean it and teach it to eat stuff on its own, because till now, 2 or 3 months after I first took it back from the pet shop, it still requires handfeeding via syringe. I hope it can start eating on its own soon! 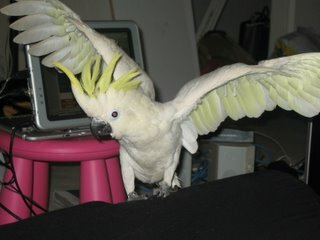 Starry is going to learn to do tricks on demand...I bought a lot of books on how to train your bird, as well as DVDs! Hope it helps... Starry is sooooo intelligent, I am sure it will be able to learn real fast. Oh well, well keep everyone posted! And if I can, will put pictures of my other birds up as well! Hey, my cockatoo looks very much like that one there.